For many of us, physical fitness is a big part of our everyday lives. Admittedly, some more than others! Plastic materials are seeing an ever-increasing use in the leisure industry, and more sophisticated compounds are being developed with each passing year for a variety of high-tech applications. But you don’t have to look that far to see just a few of the benefits that plastic provides. When it comes to general fitness, plastic sports equipment provides an almost endless array of benefits. As a synthetic material, plastic can be finely engineered to a very specific degree, allowing for improved performance. (Personally, we prefer to use our rotomoulding process for manufacturing.) Plastic is perfect for many smaller, more modest pieces of sporting equipment that don’t have such an emphasis on raw strength or endurance – for example, those small plastic weights that are used to tone muscles rather than build them. (Those ones are our favourites, incidentally. And yes, thank you, we are very well toned.) Gym staff are also fond of plastic sports equipment; because of its lightweight nature, it’s very easy to set up and set down, so within moments they can have the room ready for the next class. Also, in many cases (for example our Premier Step for Cartwright Fitness), they’re stackable and thus very easy to store – a vital advantage if you’ve got 30 of them you need to store at once. This lightweight nature also helps for the class’s attendees – that and their carefully rounded edges means that they’re as safe as possible, whether you’re seventeen or seventy. If you drop a step on your foot, for example – well, it’s probably still not a pleasant sensation, we won’t lie. But it’s light and not sharp, so you’ll still be able to use your foot again afterwards, which might not be possible if it was made of say, steel. Not only are they safe, but they’re durable and hardwearing, too – to use the Premier Step once again as an example, it essentially means that it can absorb the physical stress it’s subjected to during particularly strenuous workouts, so you know that you’re not going to put your foot through it when you’re doing a step-up. 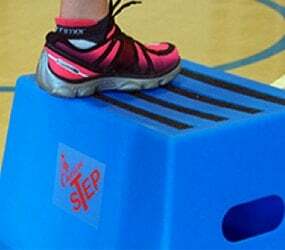 Our Premier Step is also designed with a non-slip surface, so you know you’re not going to go flying midway through your session, and its resistance to corrosion and other elements means that it can be used in any temperature or environment; indoors, outdoors, rain or shine. Exercise anywhere you like! Additionally, as a synthetic substance, plastic is not a material known for being exactly a royal feast for insects or other critters – so you’re free to put it into storage for as long as you like, safe in the knowledge that it’ll be immediately ready to use again when it comes out. We’re not big gym bunnies ourselves here at Excelsior, but we do have a very happy customer in Cartwright Fitness, who can attest to the effectiveness of plastic products in the leisure industry. You can read about some of our other case studies here, or alternatively you can click here to browse our product range. If you need any help or advice, we’re only a phone call away on 0161 765 2010. We’re here to help!